Greece defeated the Czech Republic in EuroBasket Women 2009 and keep their hopes alive of qualifying for the quarter-final. Evanthia Maltsi was the match winner for Greece with 24 points. Spain are the only team from Group E with a 100% record after coming from behind at the interval to beat Poland (67-55). In the last match of the evening the hosts Latvia lost to the Slovak Republic in a thrilling game (69-78). The results of the evening mean that all the teams still have a chance of qualification for the EuroBasket Women quarter-final. Just as people settled into their seats Evanthia Maltsi fired in a three-pointer to open the scoring for Greece. The Czech Republic took their time to settle down and found a way to break the Greek defense. With two minutes played Eva Vitecková finally got a shot to drop for the Czech Republic. This was quickly followed by a drive by Jana Veselá for the Czech Republic to go into the lead. Yet their advantage lasted only 10 seconds as Maltsi escaped her marker on top of the key and hit a three-point jump shot. The two teams stepped up in intensity and started to run a lot more as they continued to attack the basket. Although Greece are not as tall as the players from the Czech Republic they won 12 defensive rebounds as they edged the first period (16-11). Katerina Elhotova intercepted a pass at the start of the second period and held off her marker with a reserve spin to lay up for the Czech Republic. Both sides exchanged three-pointers with Zoi Dimitrakou connecting for Greece before Tereza Peckova did the same for the Czech Republic. The Czech Republic started to win offensive rebound but neither team scored for almost four minutes until Maltsi hit a long range jumper for two points. However Petra Kulichová was quickly down the other end to score. Greece, still leading (21-18), kept on looking for opportunities to break their opponents' defense. Dimitra Kalentzou managed to get a pass to Maltsi who sneaked in through the back door to score. Maltsi then fired in her third three-pointer of the game and 16th point of the game (27-18). This resulted in Milan Veverka, the head coach from the Czech Republic, calling for a time-out. Dimitrakou scored the fifth three-pointer for Greece to lead by 12 points. However Greece conceded 2 late baskets and went into the locker room with only an 8-point lead (30-22). Greece were handicapped early in the third period because Pelagia Papamichail picked up her third personal foul and had to return to the bench. The Czech Republic managed to keep Maltsi quiet as they came back to draw level (34-34) with five minutes played in the third period. However on drawing level they left Maltsi free who went on to score her fourth three-pointer of the game. Veselá and Vitecková did most of the offensive work for the Czech Republic to bring the score down only for Greece to respond with a three-pointer. Greece went into the final period leading (42-38). It was all about end to end basketball at the start of the final period. Papamichail was back for Greece and made her presence felt offensively. Maltsi was causing mayhem and scored again from behind the arc. For the Czech Republic it was Veselá who showed her skills in the art of three-point shooting. Yet Greece continued to control and was leading (51-43) with five minutes to play. 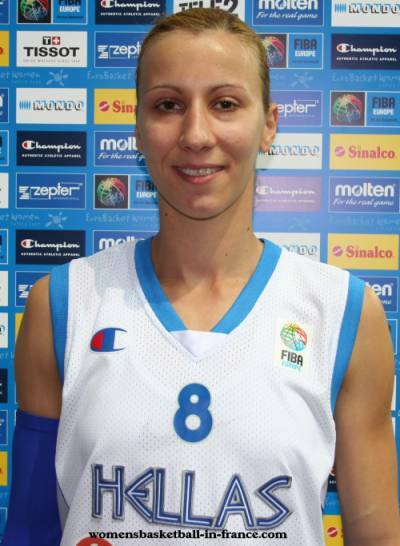 Dimitra Kalentzou struck the ninth three-pointer of the game for Greece. This was quickly followed up with an assist for Papamichail. This action brought an end to the game as a contest (56-45) with 2:48 remaining. The Czech Republic used two time-outs but were unable to find any solution. So Greece savoured the victory with a flourish of baskets at the end (62-45). 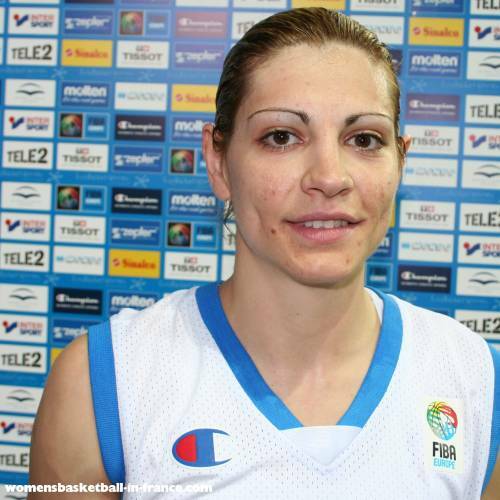 EuroBasket Women 2009 audio after match comments Styliani Kaltsidou from Greece will be joining Bourges Basket in France next season. She is happy with the way things are going at the EuroBasket Women Championship for Greece. She would have liked for Greece to have had more games but is now focusing on the all important final Qualifying Round game with the Slovak Republic on Monday, 15 June 2009. Evanthia Maltsi is looking ahead to the match with the Slovak Republic. She believes that they are the most complete team at EuroBasket Women this year. She concludes that at this stage of the competition this is the last chance for Greece so it is now all about winning and will. Both teams started lively that left them level (7-7) with five minutes played. Poland made the first break with back to back scores from Agnieszka Bibrzycka (left) and Magdalena Leciejewska to move ahead (13-9) with a little over six minutes played. Evaristo Pérez, the Spanish head coach, made some changes to the players on court. With no improvement he called for a time-out with 90 seconds remaining in the first period. Poland weathered the storm to edge the first period (15-13). Spain were more aggressive at the start of the second period and drew level through Isabel Sanchez. Justyna Jeziorna was called for an intentional foul (unsportsmanlike foul) on Sanchez which resulted in an extra free-throw for Sanchez. She connected and Spain went in front. But they were not comfortable and Krzysztof Koziorowicz, the Polish coach, changed things around. His players started playing fast break systems and scored 6 unanswered points (26-21) to regain the lead. Sanchez was the only Spanish player that kept her cool and hit a baseline three-pointer for Spain. Anna Montañana was everywhere for Spain. However Poland were not intimidated with Ewelina Kobryn fighting for everything in the paint, crisp passing from Daria Mieloszynska and scoring by Agata Gajda. Poland went into the interval ahead (39-31) after hitting a trey with less than six seconds to the end of the quarter. Kobryn got the Polish fans jumping for joy as she somehow scored with her back to the basket to open the scoring in the third period. However the joy was short lived as Spain fired in back to back three-pointers by Elisa Aguilar and Alba Torrens. Aguilar (right) scored again and Krzysztof Koziorowicz, the head coach from Poland, called for a time-out. Spain completed a 11-0 run through Torrens to go into the lead with a little over three minutes played in the third period (42-41) Laia Palau was throwing herself all round the court picking up crucial rebounds and setting up scoring opportunities. She dished out a pass for Aguilar to hit a baseline three-pointer and another for pass inside the paint for Laura Nicholls who scored in the paint (47-43). The Polish coach decided to call his second time-out of the quarter with just under three minutes to play. Spain kept up the pressure and Anna Cruz concluded a fast break on the buzzer to take Spain into the final period leading (53-45). Nicholls was having a tough battle with Kobryn but stuck to her task which eventually led to the Polish coach taking Kobryn out of the game after three minutes of the final period. Nicolls next task was keeping Leciejewska quiet before being taken out of the game with five minutes remaining. Spain leading (60-49) continued playing the player to player guarding system but used up more time before shooting. Poland on the other hand went to zone defense and attacked quickly. Poland used their last time-out with three minutes left to play. Yet whatever the coach asked for was not executed: Poland were unable to score. Instead Spain extended their advantage (65-53). Spain’s unbeaten EuroBasket Women run continues as they won (67-55) with Montañana leading the way with 16 points. EuroBasket Women 2009 audio after match comments Elisa Aguilar explained that Poland played very well during the first period and caused them problems. However during the interval they discussed possible solutions which were executed during the second half of the match. She added that as a team they did have to work on starting to play from the start and not wait for 20 minutes. On a personal note she added that the EuroBasket Women 2009 competition was going well because they were winning. The team has good chemistry and it does not matter which player steps up on any given day. Agnieszka Bibrzycka explained that Poland had not qualified for EuroBasket Women 2007. So it was great to be here. It was a young team with not much experience. She said that they had won some matches and lost some like the game against Spain which she believed they could have won. She went on to say that all is not lost and that in the last group game they would give it all for 40 minutes. Latvia won the tip-off and the ball reached the hands of Anete Jekabsone-Zogota who scored an uncontested lay-up with three seconds on the game clock. Martina Gyurcsi interrupted the Jekabsone-Zogota show as she carved out a pass for Romana Vynuchalova to score. Jekabsone-Zogota scored two three-pointers and picked up only 1 official rebound as Latvia dominated the first four minutes (11-2). Pokey Chatman, the coach from the Slovak Republic, called for an early time-out. The Slovak Republic then took their time and worked an opening for Lucia Lásková to hit a diagonal three-pointer. Katarina Hrickova added 2 more points for her side. Latvia found it difficult to break the zone defense of their opponents. With four minutes to play in the first period Ainars Zvirgzdins, the Latvian head coach, called for a time-out. He changed defensive and offensive systems and got the reaction he wanted when Gunta Basko fired in a three-pointer from the corner. The Slovak Republic were not intimated by the crowd nor by the Latvian team. They stuck to their game plan and found themselves level after a second trey by Lásková and a steal and lay-up by Jana Carnoká (15-15). Latvia managed to force their way into their guests paint and Aija Putnina managed to draw a foul. She converted her free-throws for Latvia to edge the first quarter (17-15). Ieva Tare opened her account for Latvia at the start of the second period. Then Zane Tamane came up with a block on Romana Vynuchalova. Latvia's 6-0 run was ended by Zuzana Zirková's first points of the game two minutes into the second period. However the Jekabsone-Zogota and Gunta Basko combination went to work with Basko concluding twice for Latvia to move 10 points clear (29-19) with five minutes left to play before the interval. Immediately Chapman called for a time-out, which broke up the Latvian duo. But they left Tare open to fire in from beyond the arc. The Slovak Republic continued to hustle. When Regina Palusna won a battle with Anda Eibele and scored it was the turn for the Latvian coach to call a time-out. The Slovak Republic players continued to attack and Zirková found her scoring touch with the first three-pointer. She then hit a jumper in the paint before delivering a torpedo pass for Lucia Kupcikova to score. However they could not tie the game as up jumped Jekabsone-Zogota from beyond the arc to fire in a three-pointer (35-30). There was more drama to come as the period was drawing to close. Basko did all the hard work on holding onto the ball before driving into the paint. She had to use a reverse spin but her final shot did not lift and with 0.4 seconds left Vynuchalova got the defensive rebound. She fed the ball out to Zirková who was at the mid-court line. She fired the ball in off the back-board for a buzzer beater, but it did not count as the time had expired. Latvia went into the locker room leading (36-32) with Jekabsone-Zogota leading the scoring with 14 points. Both teams continued to play aggressively. It took 90 seconds before the first basket came, which happened to be a three-pointer from Basko. Zirková fired in back to back baskets to level the score. With three minutes played Martina Gyurcsi had put the Slovak Republic in front (42-40). Gyurcsi and Jekabsone-Zogota exchanged baskets as the game went up another level. The Slovak Republic continued to keep it simple in attack and moved 6 points clear (52-46) with 3:40 to play in the third period. They did not have any obvious plan for Jekabsone-Zogota, who continued her personal crusade with her first trey of the game. However the guests having a three-point shooter in Lásková managed to extend their advantage (57-49). The game changed as Latvia stopped playing fancy basketball and went back to basics as they then trailed by 11 points. With the clock running down, Latvia worked the ball out to Basko who then fired in a shot from beyond the arc on the buzzer. The Slovak Republic went into the final period leading (61-53). The Slovak Republic took a cautious approach to start the final period. With seven minutes to play Zirková somehow managed to get into the box and fired a shot in before falling to the ground (65-54). The Latvian coach called for a time-out but nothing really changed because Lucia Kupcikova continued to do everything in defense while Gyurcsi and Zirková continued to fire in shots (70-54). Latvia had five minutes to save the game. When Tare hit a rainbow three the fans started to believe it was possible. Zirková was fouled and hit her two free-throws but Tare fired in another three-pointer. Kristine Karklina managed to strip Zirkova at mid-court and went on to score. However the Latvian coach was angry that his players did not follow up a full court press. He was right to be angry as Zirková fired a three-pointer on the counter attack. Latvia quickly got the ball up the other end for Tare who was clever in drawing a foul while scoring. Latvia still trailed by 10 points with 90 seconds to play but their guests were too experienced to let the victory go and went on to win (78-69).